The most commonly used transformer is core type. 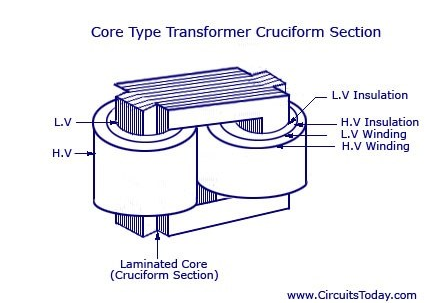 The core type transformer has windings encircling the core. The H.V. & L.V. both are placed on same limb concentrically. L.V. is placed near to core. 1. Maintenance and repair is easy. 2. Ventilation & cooling of transformer windings is easy. 3. Less leakage flux, as windings are placed concentrically. 4. Higher efficiency and better regulation. Mostly, power and distribution transformers are of core type.